Those of us who have been fans of the movie and the corresponding LEGO project have been eagerly waiting for the revelation of the finalized set. And, when the teaser-trailer was released a few days ago, we got several very pleasant surprises. First of all, the LEGO Ideas TRON set isn’t just including one Light Cycle, like in the original submission, but two! This has been a question and concern of fans of the project ever since it was approved. Will we only get Sam’s bike and we will have to build Rinzler’s by buying a second set and customizing it? Drew and Tom actually had a second LEGO Ideas project with Rinzler’s bike, but that project did not achieve enough votes to go under review. However, it seems like the LEGO Ideas team was very much aware of what fans wanted, and they ended up giving us both Light Cycles! And with two bikes, we also need two riders. So, instead of just getting a Sam Flynn minifigure, we also get Rinzler, and… huge surprise… Quorra! For those who are not familiar with the movie, TRON: Legacy (released in 2010) is the sequel to the 1982 cult classic sci-fi movie, TRON. The film follows Sam Flynn, who responds to a message from his long-lost father Kevin Flynn, and is transported into a virtual reality called the Grid. Here, Sam, his father who is trapped in the Grid, and the algorithm Quorra must stop the malevolent program Clu from invading the real world. Those inside the Grid wear cool black outfits with colored light-strips, carry Identity Disks, and race superfast Light Cycles. There is more information about the movie and the characters in the booklet that comes with the LEGO Ideas set. I’m a big fan of the TRON: Legacy movie, and always find it exciting to see LEGO fans attempting to recreate the Grid, the Light Cycles, and the characters from the film. The Light Cycles are particularly challenging models, especially when made minifig-scale. They need to be small, sturdy, sleek and emanate (or have the illusion of emanating) light. Drew and Tom did an excellent job recreating Sam’s Light Cycle by using black and translucent-light-blue elements. Because LEGO’s translucent pieces are particularly sparkly, they give a really nice glowing effect even without the addition of electric components. However, this original model was mostly meant for stationary display and wasn’t really sturdy enough for play. When the project was approved, LEGO Senior Designers Junya Suzuki and Samuel Johnson teamed up to transform the original submission into an official LEGO set. They changed the design slightly to make it more sturdy, and also smoothed down some of the lines and curves by taking advantage of recently released elements. And, they also added playability by making the wheels roll smoothly. Then, LEGO Graphic Designer Mark Tranter stepped in to create the awesome printed wheel pieces, printed Identity Disks, and the minifig body designs. Again, you can read more about the design process and the LEGO designers who worked on the project in the booklet that comes with the LEGO Ideas set. Now, let’s take a closer look at what’s in the #21314 LEGO Ideas TRON set box. The box itself is quite small; the same size as the #21110 LEGO Ideas Research Institute from 2014. Inside the box, there are two numbered bags. The first bag includes the parts to build the TRON grid/display-stand for the bikes and the three minifigures, and the second bag includes all the parts for both bikes. And, of course, there is also the instruction booklet with information of the LEGO fans who originally submitted the set, the LEGO designers who refined it, and the movie. Interestingly, this is the first LEGO Ideas set I have built that doesn’t include a brick-separator. The display-stand is pretty simple, using black and medium-azure plates, and black and translucent-light-blue tiles. One notable feature is that instead of just using standard plates, LEGO also included four 4×6 tiles with studs around three sides. As this is a fairly new piece, it’s nice to see them added here, even though they were not needed. The surface of the display-stand is almost completely smooth, except for four black jumper-plates, which are used to attach the bikes (or, they could also be used for the minifigs). I will note here that because the bikes are quite substantial, two studs for each bike are just not enough to keep them attached to the display-stand securely. I have experimented with different configurations, and found that six studs are ideal for attaching the bikes. I have added four additional jumper-plates for each side of the stand. A four-stud configuration is also pretty good, so you may try that too, but in my experience, six provides the best balance between sturdiness and still being able to remove the bikes easily. As I mentioned above, pieces for building the three minifigures are also found in the first bag. Sam and Quorra are built the same way; legs, torso, translucent-clear neck-bracket with two studs for attaching the Identity Disks, head, and hair. Both minifigs come with dual-sided heads with smiling faces and stern faces, and Sam also gets a helmet with a translucent-light-blue visor, while Quorra is equipped with a sword (with an extra one included as a spare piece). I have to say that I’m not entirely happy with Sam’s helmet. It’s too round, and doesn’t have the characteristic sloping back. However, I can’t think of any other currently available LEGO helmet that would work better, and LEGO does not produce new parts for LEGO Ideas sets. The final solution ultimately works okay, although if a better helmet comes along in the future I will look into replacing it. Another feature I’m not happy about with Sam and Quorra is the translucent-clear neck-bracket piece. It makes the attached Identity Disk stick out too much, and the connection looks unnatural. I don’t know why LEGO didn’t just use a standard black neck-bracket with one stud. I have already replaced both translucent-clear neck-brackets with standard black ones. Looks so much better in my opinion (picture below: Sam’s neck-bracket replaced, and Quorra with original clear neck-bracket). The body printing on both Sam and Quorra is gorgeous. The front and back of the torsos are fully printed, as well as the arms and the front of the legs. Sam even has printing on his feet. The white, light-blue, and gray lines are sharp, and make the printing look like it’s glowing. Really beautiful. Rinzler is built similarly as Sam and Quorra, but there are differences as well. His head only has one-sided printing, and his neck-bracket comes with a larger single pin to accommodate two disks (Rinzler is the only one in the film who has two Identity Disks). While I did not like the supplied neck-brackets for Sam and Quorra, the one for Rinzler works perfect. And, then, there is that helmet… oh, my! It is actually a re-colored Iron Man helmet (also used for a number of other Super Hero characters), and although it is not an exact replica of Rinzler’s helmet, it works very well. It is black, shiny, and super cool, with two thin silver stripes, and two small orange marks. Perhaps the orange marks could have been a bit more pronounced, but other than that, this helmet is awesome. Rinzler’s torso is fully printed front and back, but not the arms (a little disappointing). The front of the legs is printed as well. I would say that his printing is not as effective as the printing on the other two minifigs. Just like on the helmet, the orange highlights are not pronounced enough, and therefore don’t have that great glow effect as Sam and Quorra’s outfits. Still nice, but not as nice as the other two. The second bag includes all the parts for the two Light Cycles. The instructions tell you to build Rinzler’s orange bike first, then Sam’s blue one, but since they are identical, you could build them at the same time, if you prefer. Each bike is basically made up of three parts (center, front, and back) that clip together with LEGO Technic pins to form the body. There is some good usage of small parts that were introduced recently to add interesting details; 1×1 round plates with bar on the side, 1×1 round plate with bar on top, corner slopes, 1×2 gold bars in black, to name a few. Both bikes are prominently black, with a little bit of light-gray here and there. This works well, except for the handlebars. I think they look better in black. The highlights on Sam’s bike are medium-azure and translucent-light-blue, and on Rinzler’s bike orange and translucent-orange. Both combinations work exceptionally well and give the bikes a real glowing effect. This is highlighted by the attached translucent banners at the end. This is a very simple, but very effective solution. When you look at the bikes from certain angles, they really look like flying through the Grid. The most outstanding and visible feature of the Light Cycles is the wheels. The graphic designer did a stellar job on these, using beautifully printed circles of silver, medium-azure (or orange), black and white, applied on translucent-light-blue and translucent orange 4×4 dish pieces. They really add the final touches to the set. The Light Cycles are sturdy. Nothing is falling off or flimsy. The wheels are attached with a simple short rod (lightsaber blade) through a LEGO Technic pin. If you don’t push the wheels in fully, they can turn freely. Frankly, I don’t think it’s so important for the wheels to turn, but it’s nice that the option is available. The minifigs simply hover in their cockpit and are attached only by the handlebars. It’s a bit finicky to position the hands just right to grab the handlebars, but once they are attached, the riders aren’t going anywhere. I kind of feel bad for Quorra though, as she can’t join the boys in all that racing fun, but I’m glad that she is at least included. I haven’t noticed any particularly unique building techniques or parts, but building the bikes was nonetheless a fun and satisfying experience. According to the box, the set is recommended for LEGO fans 10+, but if a six-year-old is interested, they should have no trouble building it. I would compare the process to building a LEGO Ninjago bike or other smaller vehicle. The entire set took about 45 minutes to put together, and that was with me taking notes for this review. All in all, this is a solid set, and as a TRON fan, I’m super happy with it. In fact, it is better than I expected, mainly due to the inclusion of two Light Cycles, additional minifigures, and beautifully printed parts. There are some minuses that I have discussed above, but they are either minor, or can be easily fixed. I’m sure most LEGO fans will get this set as a display piece (would look striking on a white shelf, or in front of a TRON poster! ), but it is nice that LEGO designers also thought about making it sturdy enough for play. Below are a few more pictures of the finished build. Here is the official description of the set, and below is the designer video: Build, play and display with this futuristic #21314 LEGO Ideas TRON: Legacy set from Disney, featuring 2 Light Cycles, each with minifigure seats and translucent-colored light-style elements, plus a divisible TRON grid with attachment points for the vehicles. Use the grid as a display-base for the Light Cycles or split it in 2 to recreate the chase scene from Disney’s TRON: Legacy movie. Alternatively, stage an Identity Disc battle between the 3 included LEGO minifigures – Sam Flynn, Quorra and Rinzler – on the grid. This construction toy includes a booklet with information about its fan creator and LEGO designers, plus the lowdown on Disney’s TRON: Legacy movie and its main characters. Each Light Cycle measures over 1″ (5cm) high, 6” (17cm) long and 1” (4cm) wide. TRON grid/display-base measures over 8” (22cm) wide and 3” (9cm) deep. 230 pieces. Price: US $34.99 – CA $44.99 – DE 34.99€ – FR 34.99€ – UK £29.99 – DK 300DKK (Euro pricing varies by country). Available for sale on March 31st, via official LEGO stores or the Online LEGO Shop. Thanks for the great review! I was really looking forward to this set. Looks awesome! I like your idea of replacing the neck brackets. Looks much better. I plan to do that too. Thanks for the throughout explanation and review. I like the reference pictures added for comparison. The bikes look better than I expected on this scale. It’s interesting how glowing the stripes look both on the minifigs and on the bikes. Really great effect. I like everything I see, but what’s up with that price? $35 for a 230 piece set? Am I reading that right? Yeah, the price is pretty high. That’s Disney Tax for ya. I actually built the set and wrote the review before getting the press-release, and just added the official description and price at the end when I got that info. So yeah, I had no idea what the set was going to be selling for, but I was guessing in the $25-$30 range. LEGO does put Ideas sets on sale if they don’t move fast enough, so if price is an issue, you might want to wait. On the other hand, LEGO Ideas sets are limited-release, so they may sell out fast. It’s hard to tell. From people’s initial reaction here, on our social media channels, and also comments on other sites’ reviews, it seems that people like the set, and the only deterrent is the price. The printing is really the highlight of this set. Very well done. The rest seems to be common parts. I agree that the handlebars should be black and the neck brackets need to be changed. Yeah, I don’t know why LEGO choose that weird neck-bracket in the first place. The older one is working perfectly fine. I don’t like Sam’s helmet and the neck brackets, but great set otherwise. They could have maybe used a SW rebel helmet? They have that sloping back. The back of the rebel helmet would be perfect, but the front won’t work. I did look at the BrickLink database to see all the LEGO helmets and headgear, and I didn’t really find one that would have worked better. Did you guys just add the designer video? I didn’t see that earlier. The bikes the designer did for the first movie were really cool! I like these behind the scenes videos! I’m kinda on the fence with buying this set, but if the local Bricks and Minifigs has this set I can see myself getting it as I have a bit of credit with them. Yeah, there are some plusses and minuses with this set. The design is great, the minifigs are great (except for the minor issues I mentioned), but if you are not a Tron fan, there is not much here. I think this set is more like a seed for Tron fans who want to work on larger displays. Like, for example, building Quorra’s car with the Tron bike wheels would be a fun project and good challenge. Couple notes on this. 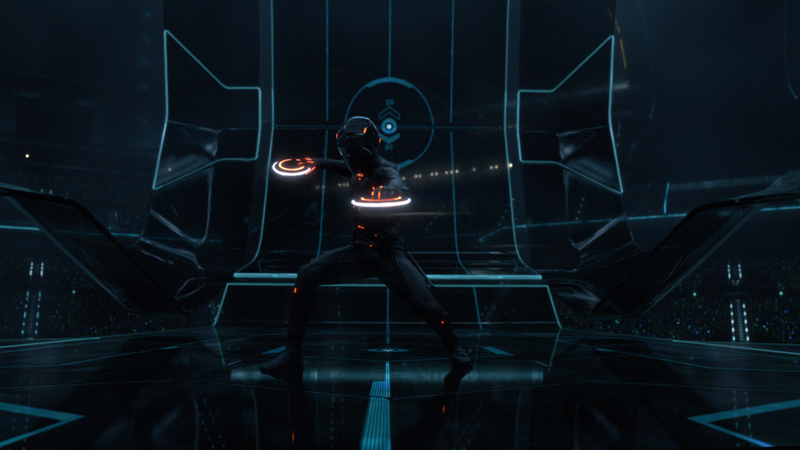 One is that all three of the screenshots of Rinzler are actually Clu instead. Rinzler doesn’t have any glowing stripes on his outfit. All he has are little orange dots, and not many at that. And the reason they didn’t use the regular neck bracket is that if you place the identity discs in their correct orientation, the disc will intersect the bottom edge of Sam’s hair and helmet, and Quorra’s hair. Switching to the two-stud neck bracket corrects that problem, allowing the disc to sit flat. This was probably required to pass the Design Department, though the fact that the disc is no longer centered on the bracket means it’s even less sturdy than if they’d just left it sitting crooked on the one-stud bracket. Dave good points. As far as the disk, I do see that they interfere just a tad with the helmet/hairpiece when oriented straight. Although this is so slight I didn’t even noticed it until you mentioned. LEGO could just have printed the design in a different orientation so that the hole on the edge of the disk faces straight up. That way there would be no interference at all. I built one copy stock, but I just modified a second copy to make it look better (getting rid of all the grey and blue bits without seriously changing the physical shape). On that copy, which I plan to take to club displays, I did swap all the neck brackets for regular single-stud versions, including Rinzler’s. In the movie, he pulls a second identity disc out of the first only after he’s removed it from his back, but he’s not carrying a stacked pair around on his back. The pin bracket is only there so kids won’t lose the second disc when he’s riding the lightcycle. As for Rinzler, his minifig is very accurate to the costume, aside from the shape of the helmet (but, Ideas…). I’ve only been able to identify a couple of light dots that are missing. On the front inside of his forearms, there’s one dot, but that part of the arm is never printed. I also just noticed while rewatching the movie that he’s got a small cluster of dots on the pinkie edge of his palm, but they never print on minifig hands either. The only thing that they really could have added that they didn’t was the armor pattern to his arms and the sides of his legs (Sam and Quorra could have used side-leg printing as well). It is also interesting to note that the set does have a flaw that appears to be an illegal connection due to putting stress on parts. As I mentioned in my review, I had trouble keeping the bikes on the grid with just the two jumper-plate studs. I originally thought this had to do with not enough studs holding on to the bikes, so I added more studs. But it is actually because the 1×8 color plate at the bottom of the bikes can’t fully attach to the studs. The wheels are just a tad wider than the body of the cycle, which allows the wheels to turn when on a flat surface. (The 1×8 color plate at the bottom clears the surface by a small gap). This is nice for turning the wheels, however, then you are expected to use the same 1×8 color plate to attach the bikes to the tiled grid. This means that the 1×8 plate will have to bend some to be able to stick to the jumper-plate studs because the wheels are in the way. Otherwise, the bike will just sort of sit on the very top of the studs, not fully attached. Basically, you have two options, press down on the bike every time you try to attach it to the studs, and thus stress the 1×8 plate – along with all the other parts attached to it. (This is probably what most people will naturally do.) Or just let the bikes sort of teeter on top of the two jumper plate studs, not fully attached. Adding more studs does work to keep the bikes on more steady, because now they will be teetering over more stud surfaces, but it doesn’t mitigate the problem of stressing parts and not being able to fully attach the bikes. I wish it included a classic white Tron minifigure. Previous post: LEGO Ideas Tron Legacy, Rocket Ride & more!